Bonus: Includes free online instructor guide access! **Free FedEx shipping to lower 48. Free Media Mail available to AK and HI. Includes separate Parent and Student Guides with a 36-Week, 4-Day schedule designed to save one day a week for co-ops, music lession, sports, field trips or other extra-curricular activities. *Do you own the Required Resources Package? *Would you like to add any LA supplements? *Do you own the History of US books? Live the thrilling story of America, from before Columbus to modern times. Guide your children with confidence; this Package provides daily plans and complete materials for the entire year. Examine events, people and debates that have molded the United States. Cheer on patriots who stood for freedom and justice ... and evaluate America's missteps with open eyes. Watch your children read, write, discuss and grow as students. You've studied American History before; now it's time to go deeper. Move chronologically to discover fascinating empires before Columbus. See why Benedict Arnold became a traitor. Meet the founding fathers who dared to create a Constitution that has become the model for countries around the world. Walk with courageous Sacajawea as she navigates the adventure of a lifetime. Survive WWII with a Japanese-American family in a California internment camp. See the daily struggles of normal African Americans who courageously changed history through the Montgomery Bus Boycott. Level 100 takes you deeper into the complex fabric of American society. Meet Americans who lived such different lives: former slaves who established a new town in Canada, teenagers who fought in the Civil War, miners who searched for gold in the Idaho Territory, Chinese immigrants who tunneled through mountains, Irish immigrants who survived the Great Depression and more. This curriculum goes far beyond historical highlights and uncovers the fascinating ups and downs of our nation's story. Includes a 36-Week, 4-Day schedule designed to save one day a week for co-ops, music lessons, sports, field trips or other extra-curricular activities. Includes map answer keys, discussion questions and answers as well as background notes to help you and your children get the most from the books. For a 3-week sample of the Parent Guide check out the Samples Tab. (Includes 2 Parent Guides and 2 Student Guides, one of each for History and one of each for Literature & Language Arts). Joy Hakim's award-winning series A History of US provides the foundation to the story of our nation with interesting text, photos, and illustrations. Several other books great books make up the history portion such as Before Columbus, Freedom Walkers, Sacajawea and more. You'll also find that we include supplemental notes in the Student and Parent Guides with additional details to help balance out points made in the books. Designed to integrate with History course material your students will read great classics like To Kill a Mockingbird, The Call of the Wild, and The Adventures of Tom Sawyer. These literary treasures will help your children's writing abilities, vocabulary, cultural literacy, and love and learning. They'll also stimulate thinking as your children encounter interesting ideas, characters, and situations. The Language Arts portion corresponds closely with the literature, offering a complete writing program that develops critical thinking skills, literary analysis, and creative writing. Includes a binder to keep your Instructor's Guides in one place, The Timeline Book for your student to visually map the progression of American History and a Markable Map to mark important Geography points. This product doesn't include additional products. To see samples of all Instructor's Guides, click here. Is BookShark a History or a Reading program? BookShark is both! We are a literature based program that teaches History through reading and listening. In Levels K-2, the focus of our program is on developing and strengthening reading ability. This is why we offer multiple Reader levels for the early packages. Beginning in Level 3, however, the focus shifts from strengthening reading ability to building reading comprehension. From Level 3 up, we integrate the Reading, Read-Alouds, and Language Arts assignments with the History readings. Instead of learning to read, your children will be reading to learn! Does the literature integrate with the History reading? Yes, it does! The literature in this package was chosen because of how well it represent the topics and times you'll be studying in History readings. The literature in this package also integrate with Language Arts assignments. This approach gives your student an opportunity to soak up subject matter in three different ways: by listening, by writing, and (of course) by reading! Please note that the literature portion of this package is only scheduled in the Historical Literature & Language Arts 130 Instructor and Student Guides, and not in the History 120 Instructor and Student Guides. Is this a High School level program? Yes, it is! American History and Literature is designed for ages 12-16 and is a High School level program. Can I use this package with both my children? Yes, you can! Your students will be able to share most of the resources in the History and Literature package, including Literature Readers and History. They can also share the Timeline Book. Please look at the “Consumables” tab to see a full list of the consumable materials in this package. If there is more than a three year age difference between your children, we recommend that you purchase a separate package for each student. What are the “Required Resources” and why are they required? The Required Resources includes a big binder with 36 week tabs for your Instructor’s Guides, The Timeline Book, a reusable Markable Map, and a set of wet-erase markers. These resources will be reused in almost every level of our History program and can be shared by multiple students. You will be given the option to purchase these items every time you buy an All-Subject or Reading with History Package, but you only need to buy it once. 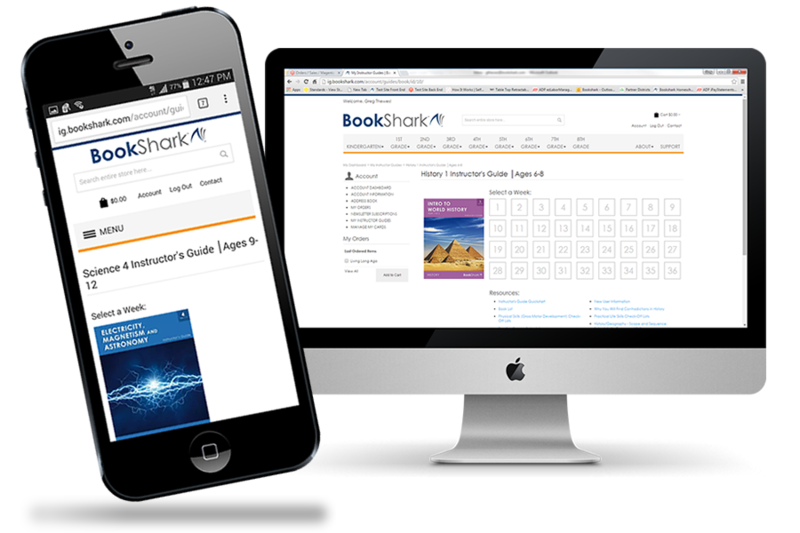 For more information on BookShark, please see our FAQs page. © 2019 BookShark. All Rights Reserved.